Home Control is all about providing safety, comfort and convenience by using simplified user interfaces to achieve complex and/or multiple outputs through the simple press of a single button or automatically by event driven inputs. A Complete Home Automation Systems consists of different systems acting as one. It is how seamless the systems are integrated together that separates easy hassle free from troublesome difficult to use systems. Make the right choice for your automated home. As a specialised Systems Integration Company we have chosen to use the award winning Leviton Security and Autmation systems for the core of the automation requirements. A Leviton Security and Autmation automated home can provide security, temperature, lighting, and audio control for comfort, convenience, and safety. The system may be accessed and controlled over the telephone or over the Internet. Leviton Security and Autmation products may be installed in new or existing homes. The multi-award wining Leviton Security and Autmation Product line includes home control systems and products to provide lighting control, whole home audio, and energy management. 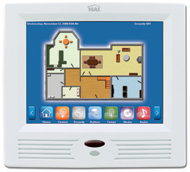 We offer a variety of interface options for our products, including OmniTouch Touchscreens (Try the HAI Omni Touch Demo) and software that allows access and control of your home over the Internet. If you are looking for a built-in UL Listed security and fire system in your home control system, you want an Leviton Security and Autmation Omni family home control system. COMFORT You can control the Heating, Ventilation and Air Conditioning (HVAC) settings of your home if you use one of Leviton Security and Automation's Omnistat line of Communicating Thermostats. Note that these thermostats may be programmed without an Leviton Security and Autmation home control system. Automated temperature controls allow comfortable temperatures while you are home and energy savings while you are away. You can schedule thermostat setbacks based on occupancy rather than time. Lighting increasingly plays an important role in the elegance and comfort that a homeowner enjoys. Dining rooms, great rooms, media rooms, and home theatres’ all benefit from lighting scenes that set the proper mood for various activities. A Leviton Security and Autmation home control system adds the ability to change your light settings by the time of day, a set schedule, by the triggering of events, via a telephone call, or by a computer connected to the Internet. Hi-Fi2 by Leviton Security and Autmation allows you to pull up music from any music source in the house. It is available as a stand-alone Whole Home Audio system, or may be integrated with Leviton Security and Automation's home control systems. Each of these systems can set each zone's source and volume for parties, watching TV, morning news, or any other activity. Leviton Security and Automation's OmniPro II home control systems will integrate with other audio systems offered. During the summer the temperature setting on your Omnistat is automatically turned up when the security system is armed in the morning. It is then automatically turned down a half hour before you normally get home in order for you to arrive home to a comfortable house. If you are leaving early from work, you can call into your home control system to manually set the temperature to where you want it to be when you get home. The bathroom lights come on at the 25% level when it is after midnight and before 6:00AM for those nights when you get up to use the bathroom. For the ultimate in convenience, your Leviton Security and Automation home control system can automate lighting sequences for "good night", "good morning", or "entertainment". Lights may be set to come on when a door is opened or when a car enters the driveway. Light up a dark hallway when motion is sensed. Enjoy lighting timed with sunset and sunrise. Set lighting levels based upon the time of the day. Create a dramatic or relaxing effect in your home with true architectural lighting scenes to enhance your enjoyment of parties, family movie nights, or romantic dinners. A Scene Switch can control the switches in a room and let you set up individual scenes using different lighting levels for the lights controlled by those switches. A House Status Switch allows the homeowner to turn all indoor and/or outdoor lights on or off from a central location. You can control your home control system through a variety of Touchscreens, consoles, keypads, and other interfaces, including Leviton Security and Automation's OmniTouch Touchscreens. The OmniTouch 5.7e comes with a standard interface for an Leviton Security and Automation home control system. This interface is customizable using Leviton Security and Automation's Automation Studio software. The OmniTouch 5.7e can show video over the Touchscreen. It is ideal for seeing who is at the front door, pool, garage, or nursery. You simply touch the Video icon and select one of the cameras for display. It can automatically display the front door camera when the doorbell rings and the pool camera if motion is detected in the pool area. Also, pressing and holding a selection button next to the video image can release a door strike to let your visitor in! Your Leviton Security and Automation home control system may also be accessed via telephone or computer. Computer access may be through Windows Media Center, by modem, or over the Internet. Remote access to the system allows you to check on the status of your home or adjust lights and temperature settings. Different music, in different rooms, for different people is one of the most exciting and fastest growing options for home entertainment. Hi-Fi by Leviton Security and Automation offers the ability to share any music in your house with any other room in the house. Audio control may also be managed by an OmniTouch Touchscreen. Have the "Walk In" Dressing room light automatically turn on when you enter and switch off when you walk out. Call your home control system over the phone to make changes to your system. While watching a DVD on your Windows Media Center loaded with Leviton Security and Automation Home Control software you hear the doorbell. Minimize the DVD window while you check your front door camera. Your dining room has a Scene Switch that sets four different lighting scenes, depending upon the desired activity, such as normal dining, romantic dining, food pickup, or party. Log into your home control system over the Internet via Snap-Link or Web-Link II and change your temperature settings. With Hi-Fi by Leviton Security and Automation, Mom listens to her classic oldies radio station while preparing dinner in the kitchen, and Suzy listens to her Top 40 radio station in the family room while doing her homework. The radio station and volume are all controlled through an OmniTouch Touchscreen. An Leviton Security and Automation Omni home control system is a fully functioning UL Listed security system - only smarter! The Omni-family system monitors and alerts you of intrusion, fire, carbon monoxide, freezing conditions, water leaks, etc. In the event of a fire, the air conditioning is turned off to deter the spread of smoke and fire. You can also set the system to turn on all of the lights in the house to aid in your family's safe exit. An Leviton Security and Automation home control system can be set up to make outbound phone calls when certain trigger events occur. Also, the home control system, when working with our Snap-Link or Web-link II software, may send out e-mails when trigger events occur. Never walk into a dark home again. Have the porch light automatically turn on when you open the front door after dark. Lighting and audio controls can make a vacant home look and sound occupied. You could set your Omni home control system to automatically call you at work when your child comes home from school and keys in his security code into the security system. View video camera feeds using our Snap-Link or Web-Link II software. Leviton Security and Automation products will make your home "greener" by making it more energy efficient. As an added benefit you will save money on your energy costs. Our House Status switches lets you see what rooms in the house have lights on when you go to bed and permit you to turn them all off from one button. Set back your Heating, Ventilation and Air Conditioning (HVAC) system in unused areas when you go to bed. Activate a beeper, then turn off HVAC if doors or windows are left open too long. Turn off lighting and HVAC when no motion is detected for an extended period. Set back HVAC and turn off lights when arming the security system. Remove "HOLD" settings and set back thermostats when going on vacation. Use Snap-Link or Web-Link II software at work to check on the house status. You can change lights and HVAC status from work if the last person to leave the home forgot to turn off lights or set back the HVAC. Leviton Security and Automation offers a full line of accessories for your Leviton Security and Automation home control system, including products that expand the systems' base capabilities, mounting equipment, sensors, and cables. Leviton Security and Automation have also worked with other companies, known as Connectivity Partners, to ensure that their products will work with the Leviton Security and Automation products. Accordingly, when you purchase Leviton Security and Automation products you are not tied into proprietary technology - you can expand your system using Leviton Security and Automation products or connectivity partner products. The integration of all the subsystems that are required in a modern automated home requires the capabilities of trained and qualified Systems Integrators to ensure that the systems function as if they are a single system where the sum of the sub-systems supersedes the capabilities of the individual parts.